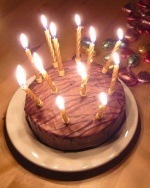 Happy Birthday Blog: Three Today! Three years ago to the day I officially started blogging and I’m still here, although only just as my posting frequency has seriously diminished over time. So, once again it’s time for my blog’s annual review and an excuse for a fairly simple, straightforward post. When I launched my blog, I optimistically planned on writing a post once a week. Over the last three years however this schedule has gradually been eroded to a pitiful average of 1.5 posts a month (18 posts in the last year). I post a monthly podcast, which accounts for 12 of last year’s posts, which means I’m now only managing to write a full post every other month, but at least I’m still here and haven’t totally given up blogging. WordPress (my choice, and THE choice of blogging platform) continues to evolve, releasing regular security and enhancement updates, which I religiously keep up with install whenever they are released. I have also installed a few extra plugins to my WordPress system to enhance its functionality and improve security. I’m now using 24 plugins (a slight increase of 5 over last year’s count). The most significant addition being a conditional CAPTCHA plugin that I added in an attempt to thwart suspected spam comments. This plugin has worked extremely well and has stopped an additional 17,173 spam comments to date! This last year I have also updated the styling of my homepage to include a featured article box at the top of the homepage with two columns underneath, one for the most recent posts and another for the most popular posts. While my posting frequency may have dwindled, my blog has still seen a steady growth in traffic. This is undoubtedly due to my back catalogue of previous posts. Unfortunately, whilst my site’s traffic continues to grow, so also does the spam. In the last year the spam comments on my site have increased by 190% (the following graph shows spam comments for the last 12 months). Fortunately, most of this spam has been trapped by the Askimet and Conditional CAPTCHA plugins. I use Google’s free analytics service to monitor my website’s traffic, which provides me with a plethora of statistic regarding the site’s performance. My blog attracts visitors from the world over; 178 countries/territories in total, an extra 4 countries visited this year compared to last year. 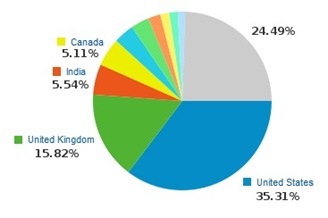 The United States and the United Kingdom remain the key countries, accounting for 51% of the traffic, with 35% of visitors coming from the US and 16% from the UK. This year India and Canada have swapped positions for third and fourth places. The RSS feed on my blog is provided through Google’s FeedBurner service, which also records a host of statistics about my blog’s subscribers. I presently have 119 subscribers (of which 21 subscribe by e-mail). This is a modest increase (32%) over last year’s total of 90 subscribers. 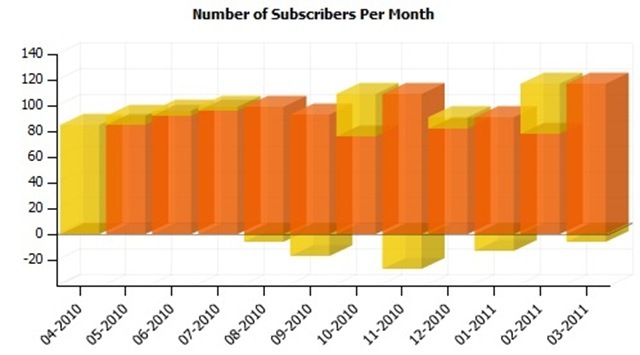 The following graph shows the RSS subscribers per month over the last year, but also shows Feedburner’s rather erratic reporting where swathes of subscribers mysteriously disappear for a while only to suddenly reappear! The most popular post by far is still Embedding Album Art in MP3 Files, consistently receiving 65% of the blog’s entire traffic. So, a quick thank you to all of you that have subscribed to my blog and follow it regularly. Thanks very much for your continued support. If you’ve just stumbled across my humble blog and have managed to make it all the way to the bottom of this post, then I thank you for your precious time. While you’re here, why not check out some of my other posts, or subscribe to be updated when I get around to posting again?